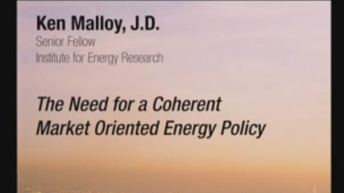 Ken Malloy is executive director of the Center for the Study of Carbon and Energy Markets. He was formerly CEO of the Center for the Advancement of Energy Markets, which he founded in 1999. He was named by Public Utilities Fortnightly as one of five “Energy Innovators: Ringing in an Age of Enlightenment.” He is internationally recognized as a bold visionary on the energy industry’s transition from monopoly to competitive markets. He has given more than 600 presentations over the past two decades to every sector of the energy industry. He was the U.S. Department of Energy’s lead career official on policies relating to competition, regulatory reform, and industry restructuring over three administrations; was deputy executive director and general counsel of the Illinois Commerce Commission; director and assistant director of the predecessor of FERC’s Office of Economic Policy; and staff attorney in FERC’s Office of General Counsel. Prior to FERC, Malloy was a law professor at Western New England College School of Law, teaching in the area of federal economic regulation of industry.